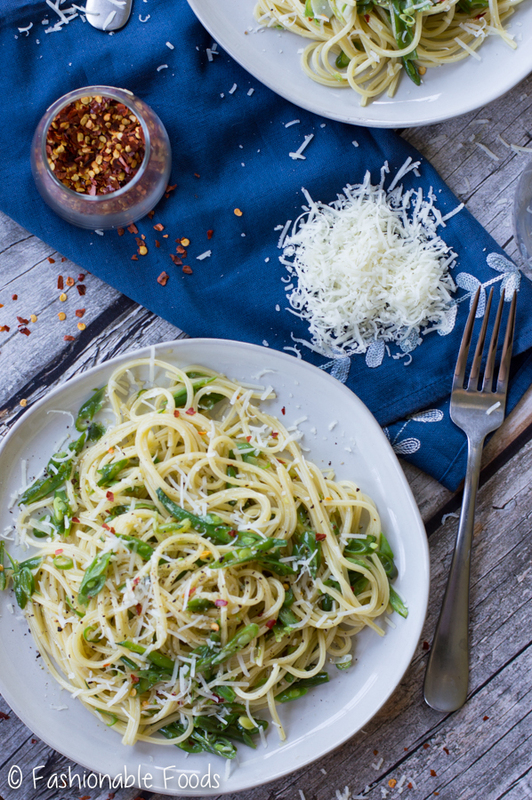 Sautéed garlic, good olive oil, a generous pinch of red pepper flakes, and tender green beans combine with strands of spaghetti for an easy 5 ingredient pasta dish. 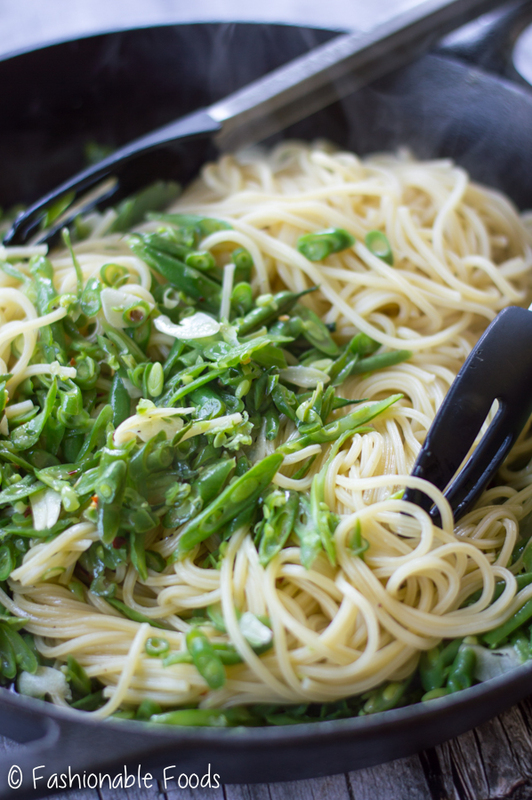 This garlicky green bean pasta is super simple, but packs a lot of flavor! It reeeeeally doesn’t feel like October. It’s basically still summer here, which means I’m not feeling fall food. 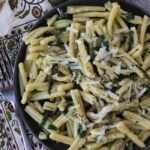 I’m still kind of in summer mode and although I made this tasty 5 ingredient pasta while it was actually summer, I forgot to share it with you all. Better late than never, right? 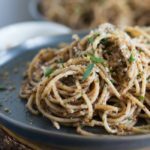 Not only is this garlicky green pasta simple to make and only 5 ingredients, but it’s a great transition recipe into fall. We’ve got a fresh summer veggie tossed with comforting pasta, making it perfect for these unseasonable fall days when you’re not quite ready to let go of summer. All you need is pasta, green beans, garlic, chili flakes (if you like a kick), good extra-virgin olive oil, salt, pepper, and pecorino romano cheese. Yes, that’s technically 8 ingredients, but salt, pepper, and olive oil are freebies in my book. We’ve all got those hanging around, right?! Once you have your ingredients gathered, you’ll want to have everything prepped and ready to go because this 5 ingredient pasta comes together fast. So, french your green beans, slice your garlic, grate your cheese, and have everything by the stove. Frenching green beans is super easy and adds a little elegance to the pasta. 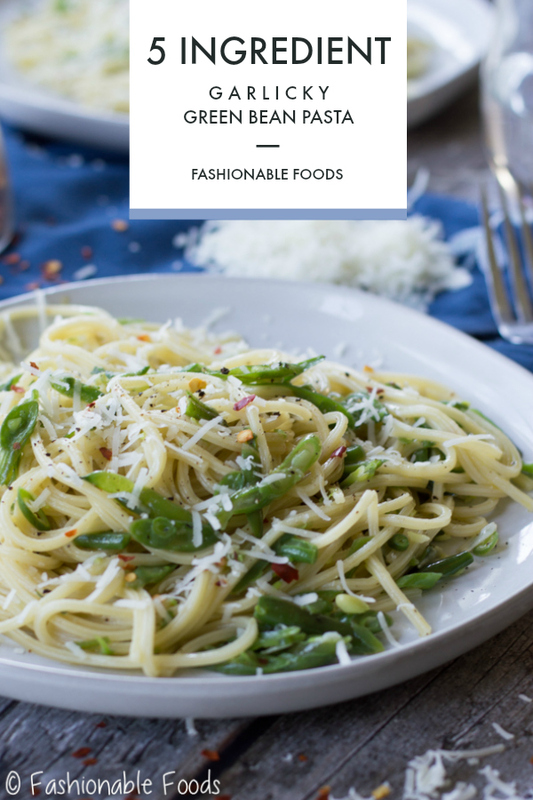 The thin slices cook quickly and combine so nicely with the pasta, making it easier to twirl it all up with a fork so you get green beans in every bite. 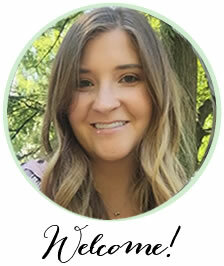 I do mine using the grating attachment on my food processor – just drop the green beans into the chute and watch all the work be done for you. Of course if you don’t have a food processor, you can simply thinly slice the beans with a knife. More time consuming, but works just fine. Or, if you want to just leave them whole that’s ok, too. You’ll just want to cook them longer until tender and I recommend looking for haricot vert when you’re buying your green beans as they are thinner than regular ones. The cooking process is really simple. 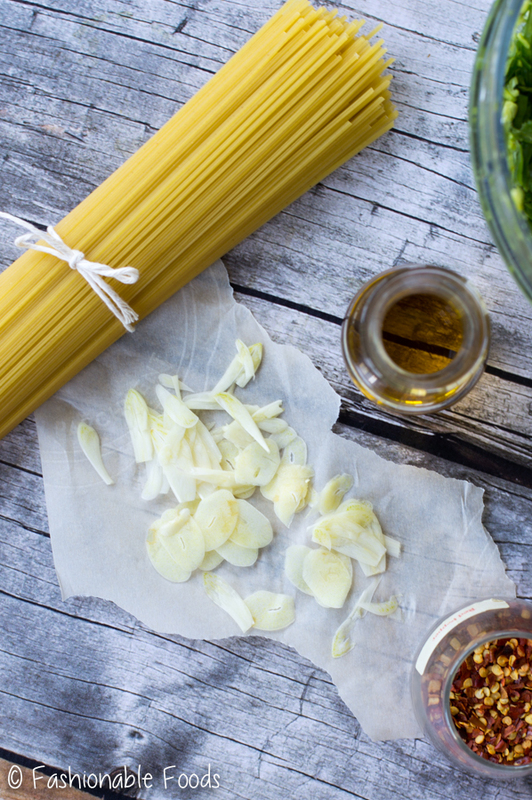 Think agilo e olio (garlic and oil pasta) where you gently simmer garlic in olive oil before stirring in pasta water. We’re doing the same thing except adding some red chili flakes and green beans. The garlic flavor isn’t overpowering at all and the pasta water mixed with extra-virgin olive oil is indescribably delicious! It makes for the best sauce. Toss in your pasta adding more pasta water as necessary and toss in a few handfuls of cheese if you’re feeling it. 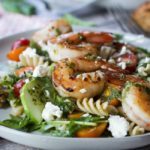 Normally I’m all about cheesy pastas, but this is one dish that I could easily eat without it! I love it either way, though. Finish things off with a few drizzles of olive oil and you’re ready to dig in. This is an eat-out-of-the-pan good pasta. The kind that you want to sneak for a midnight snack or dream about when you know you’re having the leftovers for lunch the next day. You can bet I’ve done ’em all. ? 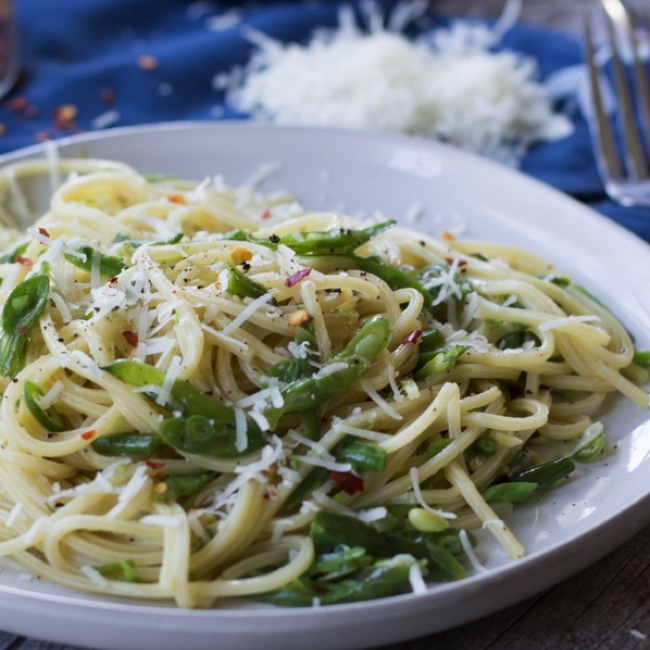 Sautéed garlic, good olive oil, a generous pinch of red pepper flakes, and tender green beans combine with strands of spaghetti for an easy weeknight pasta dish. 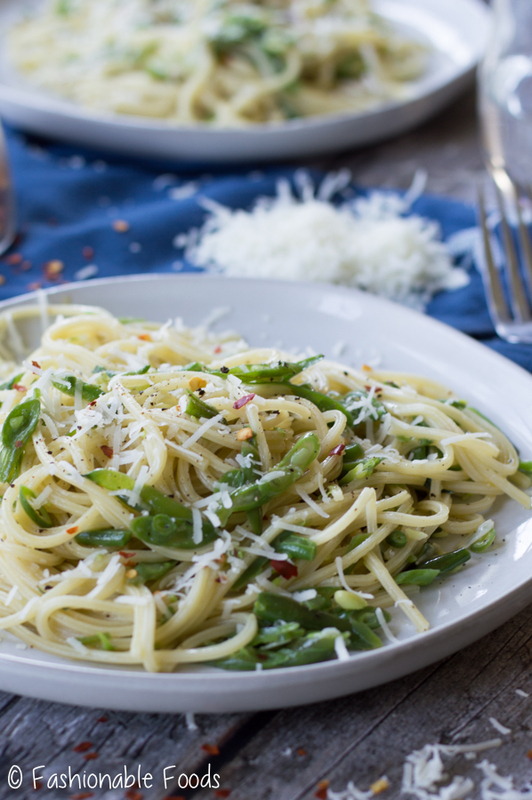 5 ingredient garlicky green bean pasta is simple, but packs a lot of flavor. Bring a large pot of water to a boil and generous salt the water before adding your spaghetti. Cook to al dente according to the package instructions. Drain, reserving 1 ½ cups of pasta water. When your pasta is almost finished cooking, heat a large skillet over medium-low heat and add the olive oil, garlic, and chili flakes. Allow the garlic and chili flakes to gently cook and sizzle for about 1 minute and then add in the green beans and cook for another minute or so on low heat. Add in ¾ cup of pasta water to continue cooking the green beans and take the bite out of the garlic while creating a luxurious sauce. Season the mixture well with salt and pepper. Toss in your cooked pasta add more pasta water if necessary to thin out the sauce. Pile the pasta onto serving dishes and garnish with grated cheese if desired and a nice drizzle of extra-virgin olive oil. Enjoy! 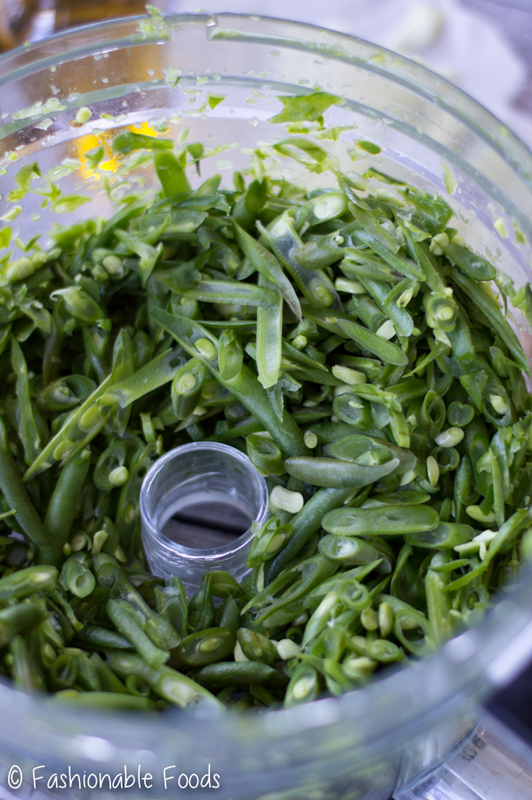 *You can easily french green beans by using the grating attachment on a food processor. You could also thinly slice them with a knife. Or, you can leave them in tact if you prefer, but you'll want to make sure and cook them long enough so that they are tender.